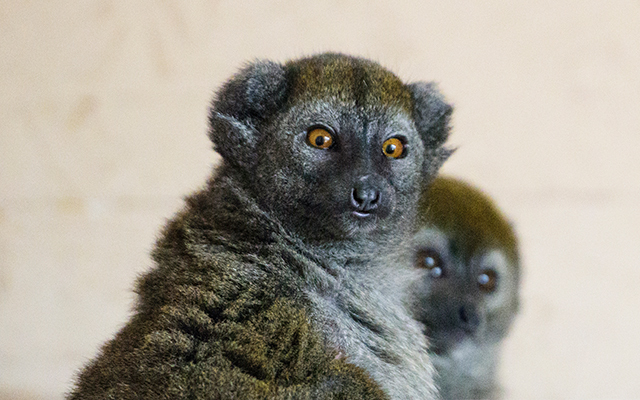 Alaotran Gentle Lemurs have a dark grey, dense, woolly coat with a chestnut muzzle and short ears. Their hands, feet and tail are used for grasping and balancing, which allows them to walk along the reed stalks in their lakeside habitat. Male Aloatran Gentle Lemurs weigh 1.4kg, whereas females weigh slightly more at 1.6kg and usually measure up to be between 30-40cm tall.. This species of lemur usually go about their activities in groups of 2-9 with the males active during the day and night. Bonds between groups are usually maintained through social grooming. They defend their territories through vocalisation, displays and scent-markings. Females give birth to a single offspring, which is carried on its mothers back for a short while after birth. Alaotran Gentle Lemurs are herbivores, meaning they feed on a variety of marsh vegetation such as reed and grasses. However, papyrus leaves make up the majority of their diet. You will find this lemur around the largest lake in Madagascar, Lake Alaotra. They are the only primate to have adapted to living in reed and papyrus beds. The Alaotran Lemur has been announced as critically endangered and a big threat to this species is the loss of their habitat, as the areas they are usually found in are gradually being converted into rice paddy fields. Further harm is being inflicted on their habitat due to the burning of the marshlands, in order to catch fish and provide areas to graze cattle. The reeds within this habitat are collected to make products such as mats and fences. Another threat to the Alaotran Gentle Lemur includes hunting for food and being caught to be sold within the pet trade. You can learn more about the Alaotran gentle lemurs' conservation status on the IUCN Red List of Threatened Species website.